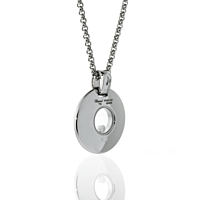 Embrace your inner royalty by donning this 18k White Gold Necklace from Chopard. As a part of the highly-sought-after Happy Diamonds line, this piece flawlessly accommodates both a classically tasteful aesthetic and a sleek, stylish new design. 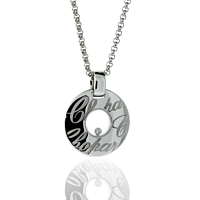 From the signature Chopard engravings on the face of the Pendant to the lone Diamond set in the center of it, this is undoubtedly a Necklace fit for any occasion.